This fundraiser is for the families of the Emanuel AME 9. All proceeds will go to the Mother Emanuel AME Hope Fund. 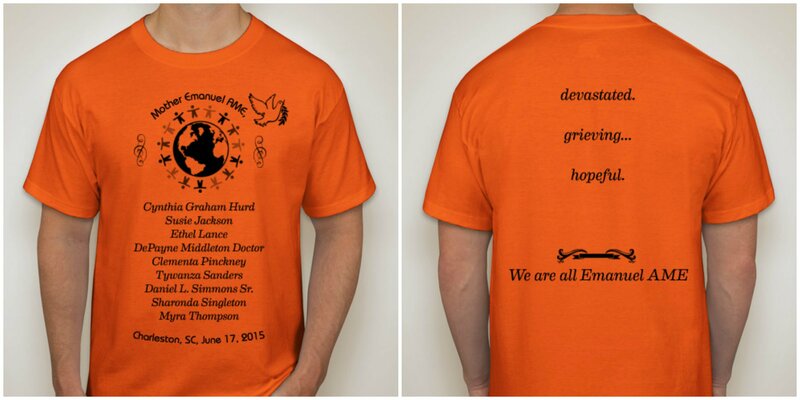 Buy a T-shirt to honor and memorialize those who died , show your solidarity with Emanuel AME and send financial support to their families. Imagine if they had died in a natural disaster. Some would say that the massacre in which they died was a natural event in this country’s evolution of violence and racism. But social analysis aside, there has to be a moment that is not about flags, gun laws, or racism—there has to be a moment that is just about souls lost, tears shed, hearts broken. So right now, take a moment and imagine if the Emanuel AME 9 had died in a natural disaster. We would remember them. They would get their moments of silence. We would think of their families. We would remember their names. Cynthia Graham Hurd, Susie Jackson, Ethel Lance, Sharonda Singleton, Myra Thompson, DePayne Middleton Doctor. We would say her name and her name and her name and her name and her name and her name., Clementa Pinckney, Tywanza Sanders, Daniel L. Simmons Sr. We would cry out “my brother” again and again and again. We would give to their widows and widowers, comfort their children, send condolences to their family and friends. And we would always be focused right there in that little spotlight on these nine people, nine names, nine families recognizing the pain of loss, the sadness of being without a father, mother, grandmother, husband, wife, sister, friend. We would see our pain in their pain, remember the way we survived the loss of our own loved ones and the only thing symbolic in our sympathy would be the extending of our comforting hand, which cannot reach hundreds of miles to touch the shoulders of their surviving family members so our hands would wave solemnly in the air—feeling the sadness, the sympathy, the empathy for each individual person and his daughters, each individual person and her grandson. This T-shirt is symbolic of our waving hands –to remember their names, our sympathy, our empathy, our oneness with the living and the deceased. The proceeds from the purchase will be sent to Emanuel AME on behalf of the victims’ families and the shirt will speak your heartfelt connection with each person who died and each family that lost a loved one. Buy your Memorial T-shirt here. 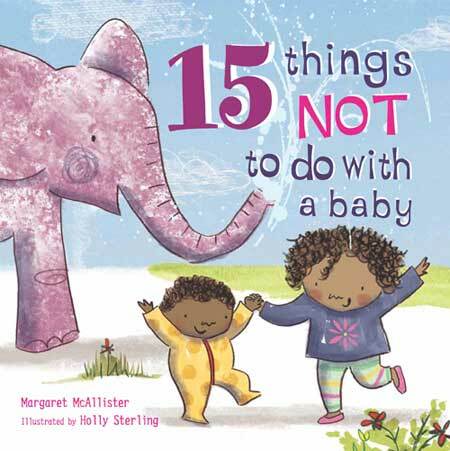 Joining the group of successful “List” books is this title by Margaret McAllister, featuring an interracial family and focused on the older sister’s shenanigans with her new born baby sibling. Like most of the “list” stories, the appeal of this book is its humor. The script and illustrations combine in hilarity with lines like “Don’t give the baby to a kangaroo,” standing alone to make one laugh while the illustration accompanying a line as simple as “Don’t take the baby to school,” gifts the scene with humor. The opening page is a family image of mommy (who is white) and daddy (who is of African Descent), the older daughter and new baby together. There is no mention of the family being interracial and the daughter and baby carry the rest of the story with their fun antics. Often, mixed heritage children of darker hue feel they have to constantly prove that they are mixed. 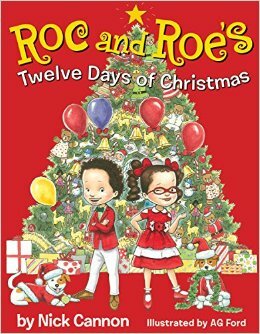 This engaging title featuring dark brown biracial children serves as a positive, fun, and encouraging reflection of deep chocolate hued mixed kids on the page. This will quickly become a favorite bed time story for your child of any background, who will ask to read it over and over again. Pe’tehn Raighn-kem Jackson has been reading since she was 18 months old. 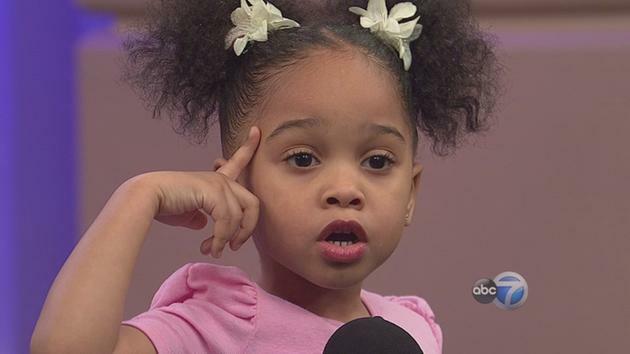 Now three, she memorized and recited Countee Cullen’s poem, “Hey Black Child” for a Black History Month event. 7 online invited her to perform the poem on air on February 25th of this year. She and her parents speak a little about teaching a child to read and write early on. They’re just a start. Do you have a video or photos of your child reading or reciting a story? If so, we’d love to share your child’s enthusiasm for books and literature with our Diverse Kids Books community. Submit your photos or videos to us in accordance with the guidelines on our Children Read Submissions Page. 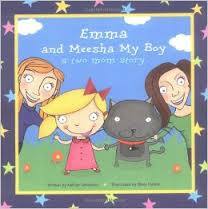 Emma and Meesha my Boy by Kaitlyn Taylor Considine is a short rhyming story about a little girl named Emma, her two moms and their chubby cat. Emma, who looks delightfully naughty, learns how to interact and treat her cat properly with help from her Mommy and Mama. In the beginning Meesha my Boy, as Emma calls her cat, is traumatized with dress up, by brown paint, and being picked up but in the end Emma is cheered on by her moms as she pets him, feeds him and cares for him gently. This book addresses the fact that Emma is part of a two mom family, but this is not the main topic of the book. The author approaches this topic as a matter of “just so you know”. The reader gets the clear message that having two moms is completely normal and nothing to really focus on. But a little girl and her cat—now, that’s a good story. 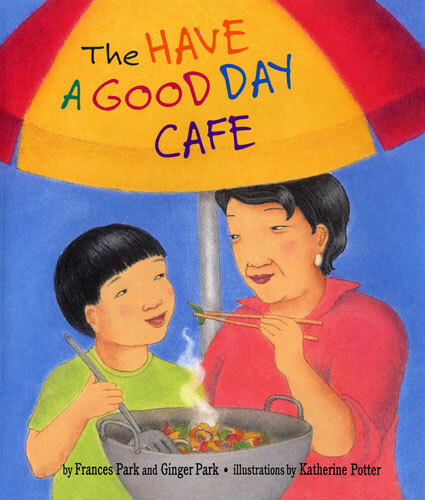 Recommendation: I highly recommend this book for readers 3-6 years old. This book is just exciting and really great for all ages. The illustrations are fun and filled with light which is highlighted by darkness: which is actually the point of Dia De Los Muertes (or Day of the Dead). It’s a time to celebrate the lives of those you love. It’s a time to make food and construct an altar to celebrate the lives of the ones who are no longer in this reality. 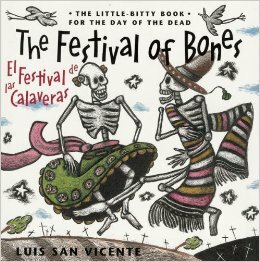 The Festival of Bones captures that other-worldliness of the holiday. The skeletons or calaveras are rushing to make it to the festival. They are riding paper airplanes across the dusty clouds and being pulled on carriages by skeletal horses, popping out of caskets, but not in a scary way, which is fantastic! The best part is this book is good for all ages. There is a section in the back with paragraphs of information including the historical relevance, how to make an altar and how to make sugar skulls. Get this book and bring it out in the Fall!